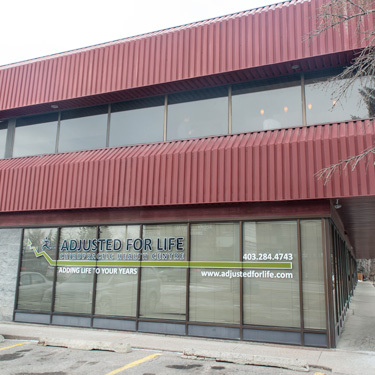 Established by Dr. Davidson, Adjusted For Life Chiropractic Health Centre has been helping Calgarians lead healthy, active lives since 1982. For years, our practice has successfully helped numerous families through quality chiropractic care and other natural health modalities, and we remain steadfast in continuing to do so today. We believe that the wellness of our patients is paramount. We are committed to helping our patients achieve their optimal health potential through clinical excellence and exceptional spinal care. We are also committed to the education of our patients, other health care professionals, and our community about the benefits of chiropractic as a natural, drug-free approach to health. Our sincere and professional staff helps us attain these objectives and encourages our patients to live the chiropractic lifestyle. You do not have to be sick to get better, and you can get better at any age! We offer diverse, drug-free care to the young, old, athletic, and non-athletic. Dr. Davidson sees patients of all ages and treats many different conditions successfully. It is never too late to begin your journey to the best version of yourself! Let us help you understand the important role that chiropractic care and other complimentary therapies can play in your life. Here at Adjusted For Life Chiropractic Health Centre, we understand that patients that are new to chiropractic may be hesitant or nervous about coming in for care. Dr. Davidson is glad to provide a detailed explanation of what to expect when it comes to your specific chiropractic adjustment. Rest assured, you are in good hands. Be sure to ask questions and voice your concerns throughout your visit. We are happy to hear from you and work with you to find a solution to your discomfort that is right for you! Schedule your visit today.